In the context of BattleTech, "Vaporware" is a term generally used by fans to describe a product that, although announced or otherwise expected, fails to materialize. BattleCorps does not usually announce publications beforehand. The exception are serialized stories and multi-part story cycles, and a number of early projects remain unfinished. Since Jason Schmetzer took over as managing editor, the policy is that BattleCorps will not purchase unfinished or incomplete multi-part stories. A multi-part serial, A Distant Thunder did not continue beyond part 2 which ended on a cliffhanger. The story's protagonist unit, the Langford Wraiths mercenary unit, also featured in the BattleCorps story The Gambit in Dream (which essentially narrated how the unit originally formed), and Dags Honor featured as a minor character in Epaulet Mate. Snippets of information can be gleaned from Jihad era sourcebooks, especially Jihad Hot Spots: 3070, that suggest the unit had a run-in with the Word of Blake, suffered hardships and injuries, and lost their integral DropShip Elizabeth before fleeing back to the Inner Sphere on another DropShip by 3070. The Forgotten Worlds serial by Herbert A. Beas II consists of two "books", The Hunt for Jardine and Finding Jardine. The prologue and first chapter of The Hunt for Jardine are available to non-subscribers as free teaser downloads from the BattleCorps site. However, the second book was not continued beyond chapter six (Part VIII of the series). When asked about the story, Herbert A. Beas commented in a BattleChat on 21 January 2012 that "I dearly want to finish the Forgotten Worlds serial, and have the entire thing outlined down to dialogue, but have simply been unable to as products piled up which are more important". On 4 April 2013 Herbert A. Beas posted a barebones summary of the book's storyline, and on 14 April 2019 he began posting the story via the "Fan Fiction" section of the BattleTech Forum, a format that technically marks it as non-canonical fan fiction. Randall Bills wrote the first two parts of the projected Founding of the Clans trilogy but they were not (initially) published in print by Roc Books after they discontinued the classic BattleTech novel line after 2002. They first two books were translated and published in Germany by FanPro as Clangründer: Abkehr (2004) and Clangründer: Traum (2006), respectively. The first part was later published in its original English edition via BattleCorps under its original title, Founding of the Clans: Fall from Glory. The second part was announced as Visions of Rebirth in 2005, but remains unpublished. The third part was not written. Announced under the title Forging of Blood, it was to begin around the end of 2815 and end on 22 May 2822, narrating the end of Operation: KLONDIKE and the death of Andery Kerensky. Originally announced as the sixth story in the Proliferation Cycle, Machine Nations was supposed to tell the story how the Capellan Confederation first obtained BattleMech technology. Announced for publication circa June 2005, it was never published. It was explained that a first draft of the story had been submitted by Loren Coleman, but was rejected for factchecking/continuity issues; the story as written could not be salvaged. On 7 May 2011 an announcement in BattleCorps' "General" news section proclaimed that Machine Nations, "a title without a story", had been consigned to history and that Jason Schmetzer had written a new story (The Spider Dances) in its place to conclude the Cycle. Although announced as a multi-part serial, only the first part of To Serve the Dragon (by Loren Coleman) was ever published. According to a MFUK publication, FASA announced a product called "Black Magic Battalion", presumably to be written in the fashion of previous scenario packs detailing a particular military unit. It was assumed that the (otherwise blank) product number 1658 was meant for this book. A price list "Prices effective August 1, 1988" refers to this product with product code #1623, which was later used for House Davion (The Federated Suns). Blackthorne's BattleForce Comic series was intended as a three-part story, named in accordance with the three lances of the protagonists' unit (Dog, Sheep and Goat lance) "The Hungry Dogs", "Black Sheep" and "Sacrificial Goats". Although announced with the title "Sacrificial Goats" in the second issue of this comic series, the third part was never released, leaving the story arc incomplete. Listed in a July 1987 FASA order form and in store adverts in gaming magazines (White Dwarf #102; Games Review #1, October 1988; also mentioned as an upcoming product in Future Wars #22) around 1988 as FASA product #1628, this sourcebook allegedly was a report on ComStar in the fashion of the House Book series, detailing the order around the year 3025. The ComStar Sourcebook may be the most prominent example of BattleTech vaporware. Some people claim to have seen (or even held in their hands) a physical copy around ca. 1989 in shops in England, Canada and the US, describing it as "a Housebook style Comstar book [...]. It had the dark blue cover of a house book with the embossed emblem of Comstar and on the back it had the shiny monocolor Comstar logo" and as "house book sized but about half as thick". This started a massive research thread on the CBT Forum which, however, failed to turn up conclusive proof that such a book existed. I never saw an official other sourcebook - if it was in the works at the time, Sam Lewis would have been all over me about it given the agonies associated with the first one. You have to be VERY careful with attempting to match up the FASA catalog numbers with reality. There were gaps, cancelled products (Like one I wrote for the Crimson Hawk's which appeared for six months worth of catalogs then evaporated with fan interest). Not to mention that in the backs of some of the novels, those little surveys you filled out, had some glaring errors. I guy approached me at a con four years ago with a patch for Clan "Sea Wolf" or something crazy like that. At first I thought he was on drugs but he told me it was the mysterious missing clan. He showed me the back of one novel survey where you could select your favorite faction...and there it was. This guy was very nice but believed he had stumbled onto the lost ark or some sinister secret. He had even written up a history for them and designed a patch logo. I told him it had to be a print mistake, but he swore he had found something we had hidden. I'm sure tonight a bunch of you are going through and checking -- when someone find it, post it. I think this mythical ComStar Sourcebook (snipe) you are chasing is probably just a rogue printed copy of some fan generated material. Artist David R. Deitrick, who had been working on the other House Books, and BattleTech author William H. Keith, Jr. were contacted by fans, but neither could recall a ComStar book prior to Pardoe's 1992 sourcebook. “ My name is Mike Mulvihill and act partly as Jordan’s historical reference man and game designer, having worked with him for 20+ years. While I wasn’t at FASA during late 80’s. I was there just a bit later and could give you a bit of perspective. 1) There were 5 “core” sourcebooks produced in 1988. That was a huge undertaking for a company that at that time had 2 other games going strong (Renegade Legion & Star Trek). The ability to maintain that schedule is the reason why in the early days books appeared out of their numerical order (as you also noted, for instance 1627 appearing before 1622 and 1623). They would create a schedule and move things around as time permitted. Thus you would see an advert for a book that may not be out for a year or so – in other words the schedules we very malleable. 2) In 1989 a 4th game was added to the FASA schedule: Shadowrun. That is why the releases from 1989 consist of many less sourcebooks – the FASA team was spread too thin to maintain 6 “core” BT products and try to do a full RPG at the same time. In 1989 they only released 2 sourcebooks and a Tech Readout. In 1990 they only released 1 sourcebook and 1 Tech Readouts. As you can see that a spiral condition would occur as a book that missed it’s date may continue to slip – some for a long time – if a more current product replaced it. 3) BattleTech was unique in that it had a awesome timeline driven by the novels. The BattleTech team would gather twice a year for a summit to go over the novels and master plots for the year and what game product would enhance the stories. If something did get bumped like the Comstar book, it may just end up not being relevant again until the novels that focus on Comstar come back around or a novelist proposes using it. It would get replaced with more immediate and concurrent products. So while that explains why Comstar didn’t exist – it doesn’t tell you how people may have remembered seeing a product. My explanation is FASA was great at crafting adverts and teasers that would look like regular books. They used to create sneak peeks brochures that put the rest of the industry to shame: 8-16+ page brochures that would feature original fiction or short stories, full color art and even items you couldn’t get in the regular source material. These were coveted by stores and fans for hints of the future plot lines, new ’mechs to use and other cool stuff. I know I worked on many of these while I was there. I’m going to assume this is what was seen in the stores. It would be the reason why you got an out of stock reference when you actually checked on the book for sale. FASA would not cancel the product, just say it was running late but it will be coming out. The stores would just list it as out of stock or unavailable. To sum up there was only one Classic BattleTech Comstar book in 1992 (#1655) – why they changed the number from 1628 to 1655 I can only guess at: a) that FASA/stores/distribution probably had cleared the old number out of their systems b) it had been listed as permanently as OOS/Unavailable c) that the name of the book and the focus had changed enough that it would confuse 1992 level software systems d) they wanted it to fit with the currently released product numbers. The FASA product code 1628 was not taken for another product, and remains blank. A Japanese website lists it with the comments "Not Available. There are rumors that there is a pre-version." In 1993, FASA received a novel about the Eridani Light Horse mercenary unit. Although the novel draft was rejected, it was suggested to the author that he should write a scenario pack instead on spec (i.e. with FASA reserving the right to accept or reject the project after receiving the complete script). They received the script and exchanged letters with the author until 1996, without either expressly accepting nor rejecting his submission. The project remained unfinished. Parts of the script, namely the revised section detailing the unit's history, were uploaded to an unofficial fan website. 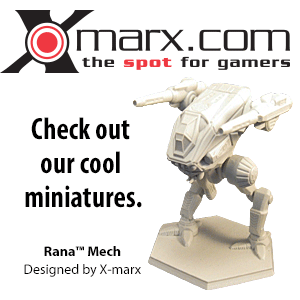 This website was adopted by WizKids in 2001 as the official BattleTech website. WizKids was apparently unaware at the time that the Eridani Light Horse history as presented on the now "official" BattleTech homepage came from an unpublished script and not from an official publication. A disagreement with the author subsequently resulted in the content in question being removed from the webite in 2005, and eventually led to the Eridani Light Horse lawsuit. The fiction is question what declared non-canonical. Around 1993, FASA planned to expand the BattleTech line through exploration of the unknown peripheries. This was envisioned as a new product line, complete with its own line of 'Explorer Corps' novels; the core product was going to be a boxed set called the "Explorer Corps Campaign Set". The idea was dropped. The boxed set was reduced to a sourcebook released in 1996 (the Explorer Corps sourcebook, FASA #1681) and only one Explorer Corps novel, Far Country, was published, with its storyline slightly different from the teaser/summary provided in the 1993 Update Flyer. Peter Rice, the author of Far Country, had initially been contracted to write at least two Explorer Corps novels but FASA cancelled the contract after the first book. Mentioned in a Battlechat by then-Lead Developer Herbert Beas, Historical: Brush Wars II would have been a second volume to Historical: Brush Wars with content from the pre-Jihad era. Historical: Brush Wars II was confirmed to be Vaporware in April 2016; it was also confirmed that Historical: Wars of the Republic Era was originally pencilled in to be Historical: Brush Wars III. Announced and promoted alongside MechWarrior Online, MechWarrior Tactics was a free-to-play turn-based tactics video game set in the BattleTech universe. It was originally under development by Roadhouse Interactive and ACRONYM Games, but was taken over by Blue Lizard Games and published by Infinite Game Publishing for the Unity Web Player platform. The game never left closed beta, allowing players to purchase instant access until the website went offline on August 28, 2014. Infinite Games Publishing began bankruptcy proceedings in October of that year, and MechWarrior Tactics was placed on sale in December, 2014. The game pitted two players against each other in an online match. The turn-based combat was presented via an isometric 3D perspective, with the play area divided into a hexagonal grid. Each player had control of four individual BattleMechs, to which they issue separate movement and combat commands which are not seen by their opponent. 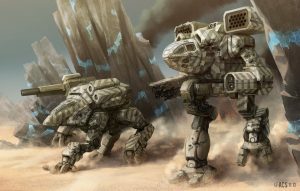 Moving the 'Mechs into certain tiles that represent forests, hills, or bodies of water granted combat advantages and disadvantages, making the skillful maneuvering of units a major aspect of the game. Likewise, the combat itself offered several tactical options, including the targeting of specific sub-sections of an enemy unit, and balancing overheating of weapons with their cool-down period. Once both players finished inputting their movement and combat orders, the action played out on both players' screens simultaneously, showing the results of their actions for that turn. The turns continued in this fashion until one player lost all of their 'Mechs. A major inspiration for the game was the BattleTech Collectible Card Game. Most items available to the player are represented in the form of virtual cards, including the 'Mechs themselves, their individual weapons, upgrades, and pilots. These cards could be purchased with real money or acquired through gameplay progression by using in-game currency. Customization performed on a particular 'Mech was carried over into future matches, giving players an incentive to invest in their card collections for the long haul rather than building up an arsenal for one specific match. The entire game was played inside a web browser window and did not require any additional downloads. Listed as an upcoming product on the webside of retailer Amazon.com, with a projected release date of December 2012. It was going to be an updated print compilation of the Objective Raid PDF-only series, but the project was cancelled. This short story was supposed to be published in Games Unplugged magazine issue #29, but the magazine folded and as far as can be established, issue #29 was either never printed, or in any case never shipped. ↑ 3.0 3.1 BattleCorps news item "At Long Last... the Proliferation Cycle"
↑ According to this posting on the CBT Forum (archived) by user 'Dark Jaguar': "I don't know if its of any interest to you (or even if its true) but the MFUK handbook stated that Fasa 1628 was a Comstar book never published and that another unpublished one was going to be called The Black Magic Battalion presumably as 1658. ↑ See this posting on the CBT Forum (archived) by user 'Jal Phoenix': "1658 doesn't appear anywhere on any of the order forms I have. Here the Black Magic Battalion reference for those who are interested, from an order form dated "Prices effective August 1, 1988". Note that it's number was reused for the House Davion book. ↑ According to the second-hand account of a person who spoke to him; the original forum posting was lost in a forum crash, but it was archived here on BTW at Talk:Far Country#Archived forum thread. This page was last edited on 15 April 2019, at 13:44.